OLS4 Integrated LED and… Laser Light Source with Wave ID… The OLS4 integrated, two-port LED and LASER light source is a cost-effective, rugged, handheld instrument designed for performing insertion loss measurements on multimode or single-mode fiber optic links when used with an optical power meter. 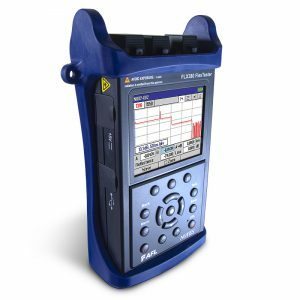 The OLS4 integrated, two-port LED and LASER light source is a cost-effective, rugged, handheld instrument designed for performing insertion loss measurements on multimode or single-mode fiber optic links when used with an optical power meter. When paired with an optical fiber identifier, the OLS4 may be used for fiber identification. The LED and LASER outputs are stabilized to ensure accurate test results per current TIA/EIA requirements. The OLS4 features 850 nm and 1300 nm LED output from a multimode output port and 1310 nm and 1550 nm LASER output from a single-mode output port. This light source offers 4 modes of operation: Dual wavelengths sending ID, single wavelength sending ID, CW, and modulated Tone. [Active Output], [Tone], [Battery], and [External Power] indicators identify the currently enabled operating mode, battery charge status, and external power presence. Both output ports are equipped with removable SC (FC & ST available) adapters to allow the output connectors to be inspected and cleaned. In addition to being powered by two AA alkaline batteries, the OLS4 can be powered by optional AC adapter and/or rechargeable NiMH battery pack. The OLS4 is fully N.I.S.T. traceable. The 850 and 1300 nm LED output can be used for testing Gigabit Ethernet, Token Ring, FDDI, and other multimode LAN systems. The 1310 and 1550 nm LASER output can be used for single-mode applications, such as Telecom or CATV. In the modulation Tone mode, the OLS4 generates a Tone signal into single-mode fiber. 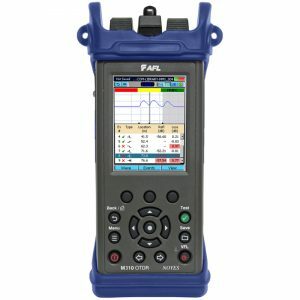 This signal is detected by the OFI-200, optical fiber identifier, to isolate specific fibers in a bundle prior to splicing or rerouting. The Buy It Now price includes a free hour of hands-on training on this unit and any other Noyes or Fujikura products at our New Hampshire Training Center. We are an authorized AFL Fujikura and Noyes distributor. Ask about our First Time Customer discount. 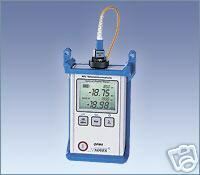 We sell additional Test Equipment and Networking Products. See our other auctions. International Experts , On parle français. Se habla español.